The Egyptian subsidiary of the world’s largest hamburger chain, McDonald’s, is increasing its investment in Egypt by LE1 billion ($144 million) starting 2013 and covering seven years in order to open more branches nationwide, an official insider told Reuters Saturday. 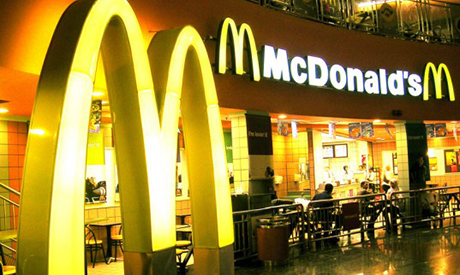 Alaa Fathy, general manager of McDonald’s Egypt, said that the company plans to have 170 branches open in 10 Egyptian governorates compared to the current 79 in eight governorates. According to Fathy, McDonald’s Egypt also foresees raising its annual sales by 250 percent to reach LE1.9 billion ($0.2 billion) in 2020, up from LE750 million ($107 million) recorded in 2013. “We have the financial ability to cover 65 percent of our investment expanding plan, while the remaining will be through bank loans,” Reuters quoted Fathy as saying. Total revenues of the US-based global chain rose two percent in 2013 compared to the year before, hitting $28.1 billion, official corporate data shows.